descended from heaven and came and rolled back the stone and sat on it. His appearance was like lightning and his clothing white as snow. "Do not be afraid, for I know that you seek Jesus, who was crucified. 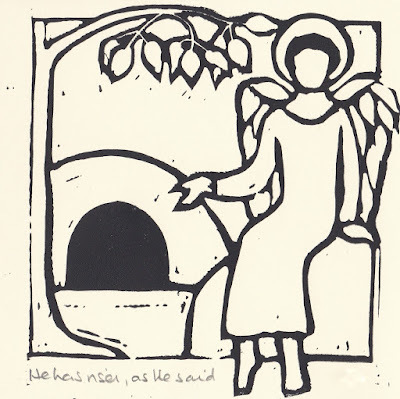 He is not here, for He has risen, as He said. Come, see the place where He lay." Yesterday was Palm Sunday, the beginning of Holy Week. At Mass we commemorated with palm branches Christ's entry into Jerusalem, when the crowds cheered Him as their Messiah; then we listened to the story of His Passion and death upon the Cross, as the authorities sought to regain their influence by turning the crowds against Him. This week is a time of quiet reflection, culminating in the three services of the Easter Triduum - Maundy Thursday, Good Friday and the Easter Saturday Vigil, when we celebrate His rising from the dead. When reflecting on a Bible story we can mentally place ourselves within it, so as to gain deeper insight. 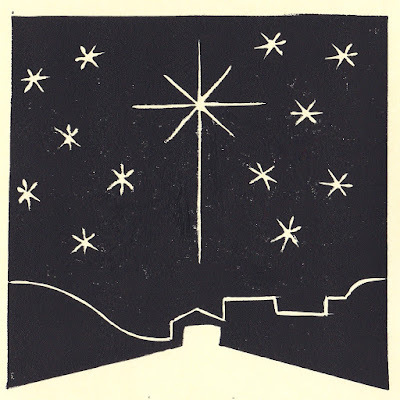 We walk to the tomb with the two Marys before sunrise. We are devastated - our friend, our Saviour, has just been put to death in the most horrible way, and all our hopes have been dashed. We are scared and apprehensive, but desparate to visit the tomb, to prepare His body with spices. Will we be able to persuade the guards to move the stone from the entrance so that we might go in? And then the ground shakes and an angel appears, rolling away the stone and sitting on it. If we were scared before, we are terrified now! The guards fall unconscious to the ground with fright. The angel offers words of reassurance: Do not be afraid. He has risen, as He said. Can we even begin to take this in, to understand what is happening? Bewilderment, then joy. Everything He told us has come true. This is not simply a tale of something incredible which occurred centuries ago. Christ can be born again in us every day, not simply at Easter. We just have to be open to Him. Do not be afraid. Wishing you and yours every blessing at Easter and always. I suppose it was inevitable. 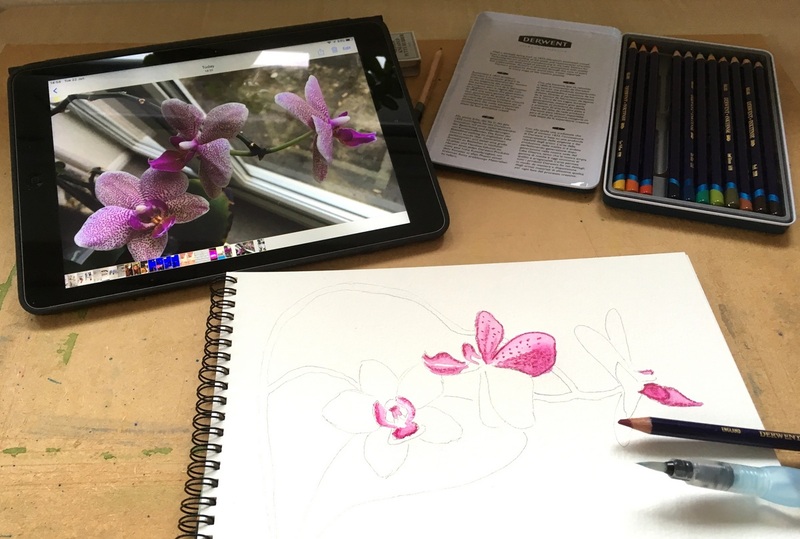 The moment I put down the David Hockney art books my husband gave me for Christmas, with their pages and pages of drawings made on an iPhone and iPad, I reached for my own devices and started playing. Hockney's images are, of course, little masterpieces, often crudely drawn but always with a real sense of the subject. My efforts are basically doodles made while working out how to use the Brushes app. I started with patterns and imaginary faces - cartoon-like line drawings or more considered layered images, as I tried to build volume and shading. The thought of being able to dash off a quick sketch on my iPhone, any time, any place, anywhere, was exciting. Another Christmas present - a DVD of the amazing animated painted film Loving Vincent - had me doodling away in a rough approximation of the style of Vincent van Gogh. I was surprised at how effective the daytime picture turned out to be, despite the speed with which I laid it down. More recently I've been following in Hockney's footsteps again, by dashing off quick interpretations of items round the house. At some point I will get back to "proper" sketching, but for now the digital version has me hooked! 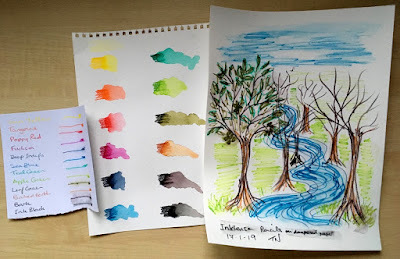 As the studio reorganisation continues, I've been looking through some old watercolours - some even older than this blog. The first piece, of the flamenco dancer Sara Baras, was made from a photo as a demo during my very first Open Studios, and includes some spectacular granulation. Next, I came across two paintings of lilies, made three years apart. 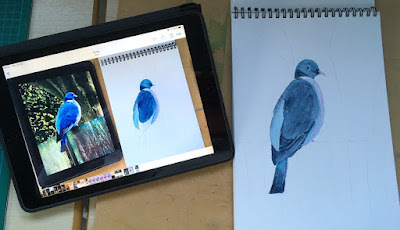 The first one is a quick sketch, drawing straight onto the paper with the paint, while I remember putting more work into the second one. Years ago I would have told you that I preferred the sketch, but looking at them now I think the other one is my favourite. I love this red tulips picture because it includes two of my favourite vases - a cream Edwardian milk pitcher which still sits in the kitchen of my current home, and the small yellow glass jug which was my grandmother's, and which lives in my studio. The snow scene was an experiment based around the idea that white is rarely just white. Here, it's purple, green, yellow and blue. It's another piece which I appreciate more now than I did when it was first painted. But then I rarely like anything when I've just finished it - my favourite is always the next project . . . Finally, a painting made from a holiday photo. I'd also made a quick watercolour sketch in situ, so the subject wasn't entirely new to me. I loved Rome, and the pines, so this brings back happy memories! Recently I've re-organised the storage of my linocuts and photos, creating something of an archive in the process. It's been a useful and interesting exercise - not to mention an excellent displacement activity for artists' block - as well as a trip down memory lane. I'd forgotten the obsession with water and reflections which characterised some of my first attempts to move beyond taking holiday snaps; together with my love of quirky shots, water is still one of my favourite subjects. My early linocuts were almost all reductions - ambitious, but I was swept away by my enthusiasm for the exciting medium I'd just discovered. Looking back, I'm quite pleased with the results, although at the time I didn't think much of them, longing to run before I could walk. If I took several photos of something, chances were I'd put them together in some kind of collection. Who knew the centres of tulips could be so fascinating? or close-ups of seaweed? or different versions of the same shot, played about with? The linocuts in the archive drawer may be deceptive: often the archived version is a poor representative, the only one in the edition not good enough to sell. How I wish I'd kept some of the better ones back . . . There are some treasures, though; happy memories and examples of photos and prints which were extremely popular in their time. The ones shown here are all at least six years old, and it's good to see them get an airing again! Once again I'd been looking forward to the annual Parish Pilgrimage to Lourdes for Our Lady's feast day (11th February). The twelve of us travelled light, but packed for every eventuality; Lourdes sits in the foothills of the Pyrenees with its own micro-climate, so waterproofs and good shoes are a must. This year we had a mixture of sunshine and showers; and some torrential rain as we prayed the open air Stations of the Cross. The hairdryer in my hotel room came in handy for drying my socks and boots and gloves. The sturdy rain mac I bought in Lourdes on an early visit covered the rest of me . . .
We had daily Mass and, on the feast day itself, joined around 20,000 fellow pilgrims for an international Mass and a blessing of the sick, both in several languages. We went to the baths and to confession, prayed at the grotto and lit candles for the many people who had asked us to pray for them. The schedule also allowed for shopping; there are all sorts of shops in Lourdes, some of which sell the most amazing tat, often alongside beautiful religious artefacts. I learnt long ago not to write off any of them; you'll find something, whether it's cheap and cheerful or of real quality. shops crowded with religious artefacts and . . . a Christmas tree? Finally, there was the torchlight procession: hundreds of pilgrims with candles, singing and praying the rosary as they followed the statue of Our Lady of Lourdes around the domain. Coachloads of pilgrims departed overnight or the next morning as the shops and hotels prepared to close until Easter. My Christmas reading included several art books, one of which recommended the use of Derwent Inktense pencils to add definition to watercolour paintings. Keen to try out something new, I ordered myself a set of twelve. 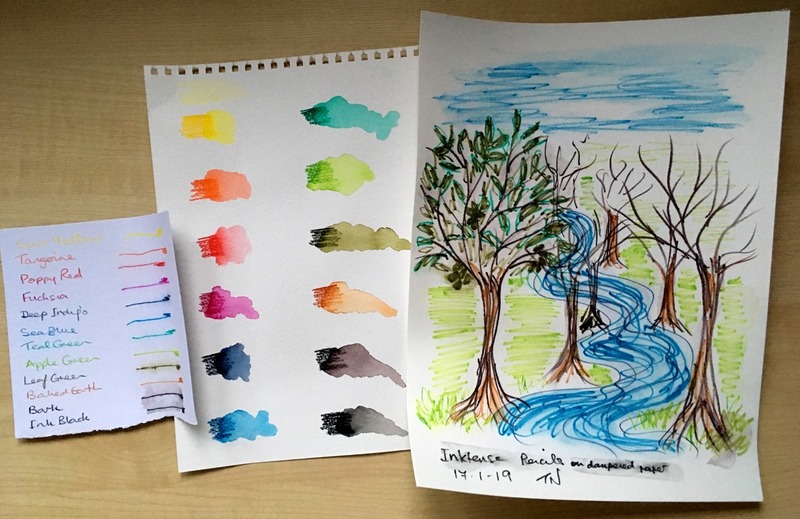 When they arrived I tried out the colours and made a quick drawing onto damp paper, to give me an idea of how they could be used with watercolour. I liked the vivid hues, and the fact that once dry, the colours were permanent. This had possibilities! 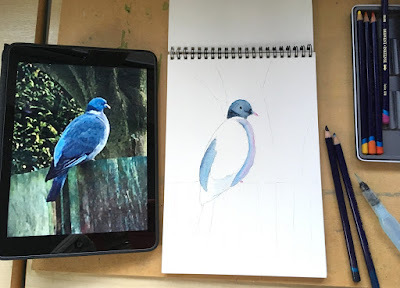 is it drawing or painting? To find out how else to use the pencils, I took a look at several videos on YouTube. 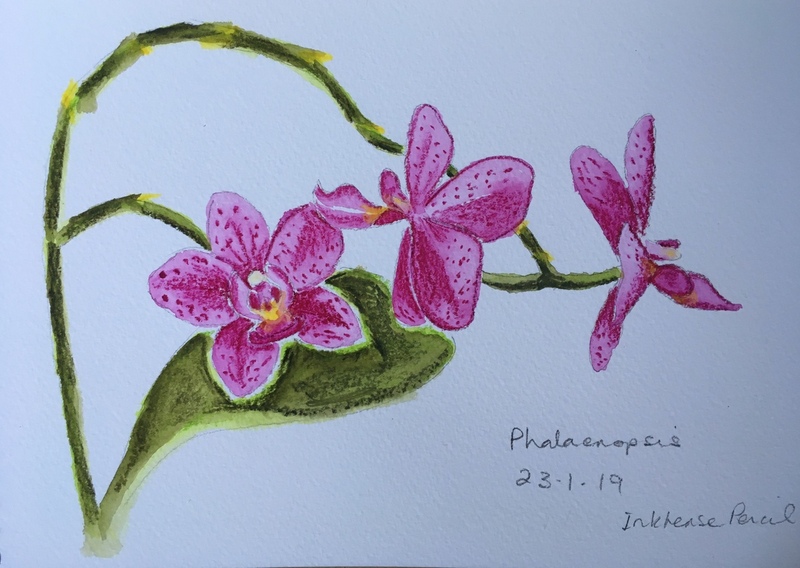 One artist was using a water brush to produce some wonderfully delicate designs. Didn't I have a water brush somewhere? I did indeed - one which has sat ignored in my studio for more than ten years, since I bought it for my first short course at Central St Martins. Now, as it started to come into its own, I began to wonder why I'd never used it for anything before. I drew from photos I'd taken on the iPad, sketching an outline before teasing the colour from the Inktense pencils. I was a bit tentative with the orchid at first, only relaxing into the mark-making once I got the hang of the technique. By the time I made the pigeon drawing, I was a lot more confident. I even used one of the photos I took for this blog as an inspiration for the colours on the fence. The sketches were great fun to do and another way of keeping some regular drawing going! New Year, new camera . . . There are times when any decision is better than no decision. I've been dithering about replacing my old compact camera for a couple of years - so much so that all my recent photos have been taken on my iPhone. Choice was my problem - far too much of it. Another compact? A CSC? A digital DSLR? And which brand? Would I have time to learn how to use a camera which required separate lenses? I pored over articles on the Which website and checked out models on Techradar, but still couldn't make up my mind. It was Sue who pointed out that I would be unlikely to cart a DSLR or CSC around with its various lenses. She also reminded me that it's difficult to go wrong with a Canon. So I took the plunge and ordered their Powershot SX730 HS. It's been a joy starting to get to know the features of this camera. I probably won't get around to using them all - the online manual runs to 190 pages - but the 40x optical zoom has already enabled me to snap wildlife in my garden through the studio window, resting the camera on a handily placed ornament. It's small and light enough to slip into a handbag but powerful enough to enable some really exciting shots - on a walk through the nearby lanes I managed to capture a squirrel as he made his way from tree to tree. I've tried my favourite into-the-sun shots, pics of the sky, flowers on macro, and learnt that if I am patient and keep following him with my camera, eventually I will get a decent shot of that robin - although it might not be so easy if I wasn't behind a window pane! 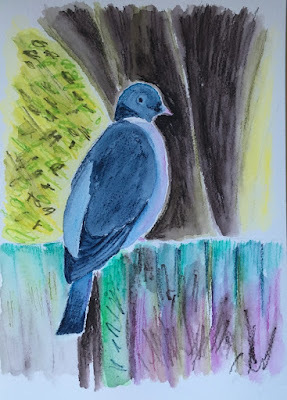 I've also discovered that the blackbirds in my garden are making work for me, intent as they are on grubbing through the decorative bark of the borders. Presumably they're after insects or worms as they happily chuck chippings all over the path . . . There's still a lot to get used to - the file sizes are HUGE, which means I can crop right in as I have done with some of the images in this post. Other than that, they haven't needed much editing. I'm enjoying photography again! There's a powerful message which builds throughout the song, so please do click on the lyrics to hear the choir of Kings College Cambridge sing the full version! 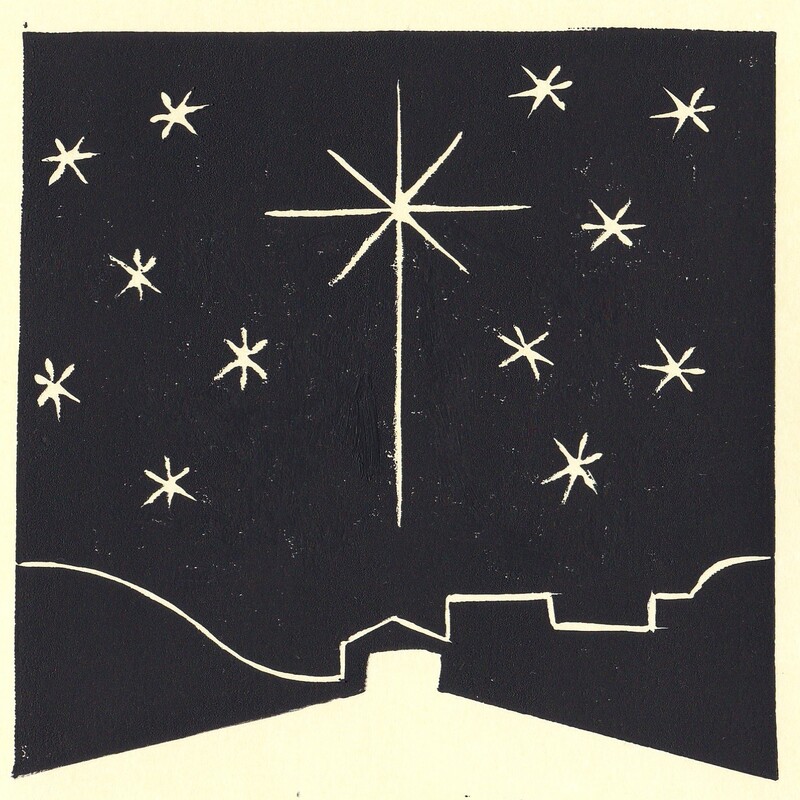 Wishing you all peace and joy this Christmas, and a blessed and Happy New Year. a drawing a day - what do artists do all day? Parish Christmas Fair - from set up to take down! I blame Peter Jackson, or rather, the BBC programme "What Do Artists Do All Day?" The answer in his case seemed to consist of sprawling on the sofa in an editing suite looking at WW1 footage restored and coloured for the acclaimed documentary They Shall Not Grow Old. daily life - it's not all glamour you know! How, I wondered, would I answer that question? "Not making much art" would be the honest answer, at least during the run up to Christmas, when church and family commitments and the shortening days don't allow much time and space for creativity. church music features a lot at this time of year . . .
That's when I decided to use an old half-empty A4 sketchbook to create a visual diary. That way I'd be getting something down on paper most days. Also I'd be able to answer the question in the unlikely event that anyone should ask me.
. . . but there's still (some) time for art! 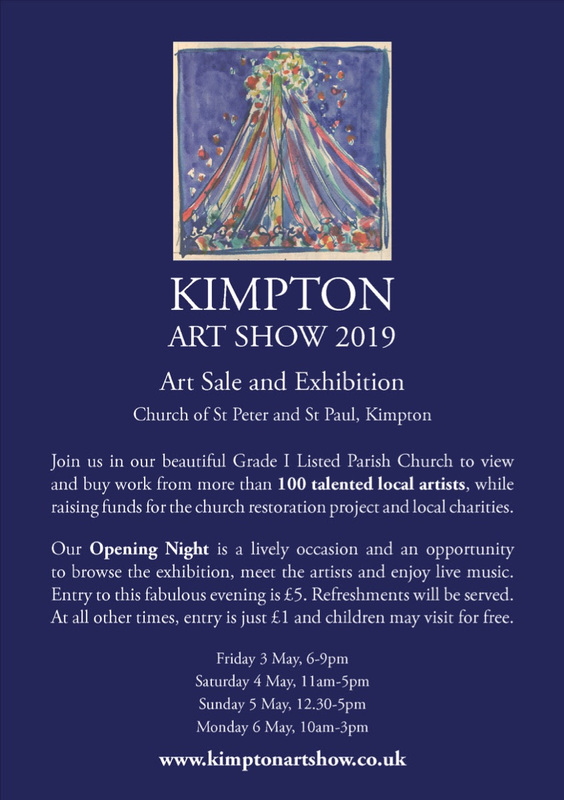 I've been keeping the diary for a month now - a busy month involving some art, but rather more music, both church and secular (it's that time of year), all of it wonderful. I've tried to include everyday activities, too, and not just the special events - this isn't Facebook or Instagram . . . 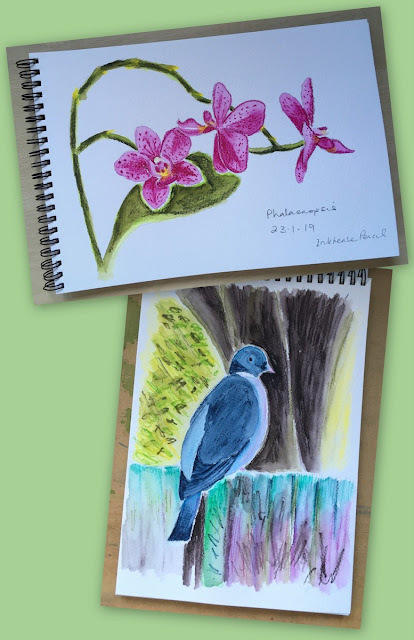 I've experimented with Conté crayons and coloured pencil, as well as my favourite Zig pens, particularly on some of the coloured paper in the sketchbook. This has had mixed results, as fixative has to be used on such drawings, which doesn't sit well on the paper. But it was worth a try. Mostly I've drawn from memory, but also from photos. I've learned not to sketch when I'm tired or short of time, and tried deliberately not to make the drawings perfect. This is a bit of fun, and the daily discipline is doing me good!